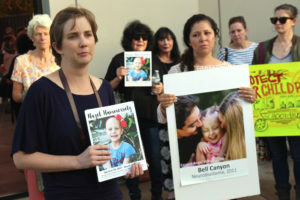 Melissa Bumstead holds a photograph of Hazel Hammersley, a 7 year old who died on March 30 after a 5 year battle with Neuroblastoma, at a demonstration demanding DTSC keep its promise to fully clean up SSFL. DTSC and the parties responsible for the pollution—Boeing, the Department of Energy, and NASA—have violated binding cleanup agreements that committed that all of the contamination would be cleaned up by 2017. That deadline has passed and the cleanup hasn’t even begun. Now DTSC is projecting that if there are no further delays, cleanup completion won’t be completed until 2034 — 17 years beyond the state mandated by the cleanup agreements, and nearly 90 years from the time the contamination started. The local community is mourning the recent passing of seven year old Hazel Hammersley, who lost her five-year battle against Neuroblastoma on March 30. Hazel’s mother suspects that her daughter’s aggressive cancer may have been caused by exposure to contamination from the Santa Susana Field Lab. “Losing Hazel has been devastating for us, but her mother wants us to use her passing to push even harder for this cleanup,” said Melissa Bumstead, a West HIlls resident whose own daughter Grace is recovering her second fight against cancer. During Grace’s first treatment at Children’s Hospital Los Angeles, Melissa met Lauren and other parents of children with rare cancers who live near SSFL. Melissa mapped over 50 such cases, and now leads efforts to organize families to fight for the promised cleanup. Last year Melissa launched a Change.org petition that currently has over 143,000 signatures. Change.org released a new video promoting the petition, which can be viewed at the bottom of this post. 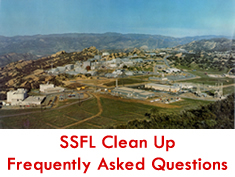 Decades of nuclear and rocket engine testing activities, including a partial nuclear meltdown and other toxic releases and spills, left SSFL heavily polluted with radiological and chemical contamination. Government-funded studies indicate increased cancers for exposed workers and among offsite populations associated with proximity to the SSFL. Besides the unacceptable delays, DTSC and the responsible parties are now breaking their commitments to a full cleanup, proposing instead to leave more than 90% of the contamination on site permanently. As it stands now, DTSC’s cleanup plans could put half a million nearby residents at risk of nuclear and chemical exposure for generations. Please sign and share Melissa’s petition – see https://www.change.org/SantaSusana.